The potential for flooding and high waters caused by Hurricane Florence reminds us here in Washington that the National Mall and surrounding federal buildings are vulnerable to storms and floods. Mall flooding is not an anomaly. It has happened several times before. 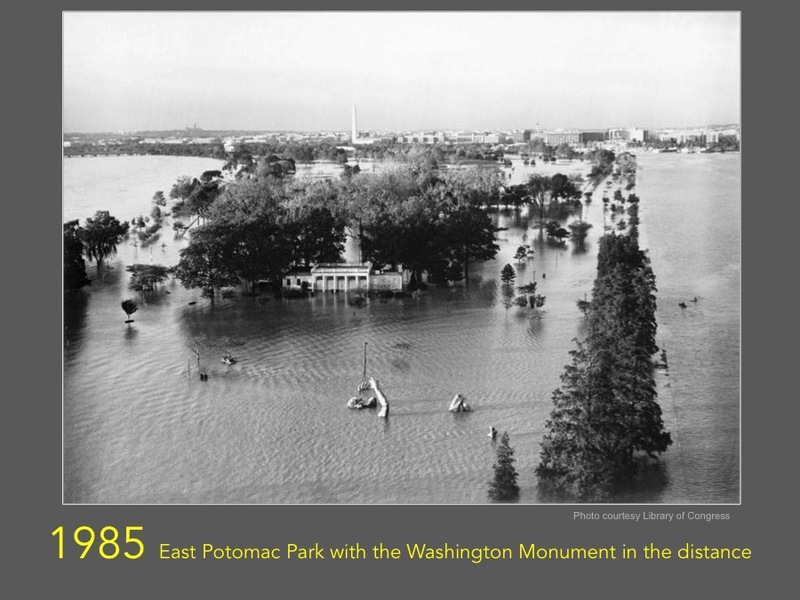 The most recent, and the most devastating, was in 2006 when heavy rains overwhelmed stormwater drains and inundated Constitution Avenue, causing millions of dollars in damage to Mall museums, roads, businesses, and federal buildings. The National Archives remained closed for three weeks. The June 2006 stormwater flooding caused millions of dollars in damage to, clockwise from upper left, federal office buildings, the Department of Justice, the basement theater in the National Archives, and the 12th Street tunnel under the Mall. Bracing for “torrential rain,” on Tuesday, DC’s Mayor Muriel Bowser declared a state of emergency and Metro is putting in place sandbags around vulnerable Metro stations including in the Federal Triangle and the Mall. And for the first time, the National Park Service is preparing to test its new 17th St levee if the Potomac River threatens to overflow its banks and flood 17th Street at Constitution Avenue. But even if the levee succeeds in holding back river waters, the Mall is still vulnerable to a different yet equally destructive flood threat, namely stormwater flooding during heavy rains as water flows from higher ground in the city down to low-lying Constitution Avenue and the Mall. This is the type of stormwater or “interior” flooding that caused devastating damage in 2006. A 2011 government report on the 2006 event raised the alarm of future and more intense flooding. Though the report proposed some viable solutions, no stormwater solution has even been agreed upon, let alone implemented. So what could Hurricane Florence portend for the Mall? Worst case scenario could bring a repeat of 2006 with millions of dollars in damage to our public museums and buildings and potential loss of invaluable cultural resources. On a positive note, federal and DC government bodies are beginning to collaborate on addressing the stormwater flooding problem. A September 5th meeting of the Silver Jackets flood group discussed a few solutions, including a stormwater cistern under the Mall. At the slow pace of action since 2006, however, a solution providing reliable relief from threats such as Florence may be years away.